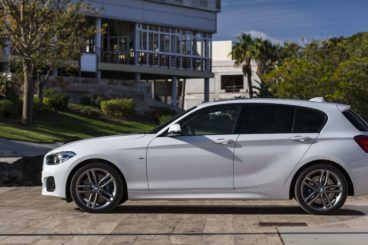 The new BMW 1 Series Hatchback combines a smart interior with a peerless driving experience to present itself as the quintessential premium family hatchback package. For any of you who need to make the transition from hot-hatch to just hatch, the good news here is that as it’s the only rear-wheel drive car in this particular market, snapping up one of these means you won’t need to give up your love of driving just yet. One for the driving enthusiasts, this small family car mixes substance with a bit of pizzazz. It’s a tempting proposition. OSV takes a closer look at what it’s all about with our BMW 1 Series Hatchback review. This is easily the best car to drive in this sector. All engines are keen performers, and the car handles superbly. It might be the entry-level offering, but the 1.6-litre petrol engine which powers the 118i model is capable of thrusting you from rest to 62mph in 8.5 seconds. The steering is light and precise, and the chassis is responsive. As a result, the engine is just as at home on the motorway as it is about town. The M135i is the jewel in the crown, though and is a Hot Hatch. Delivering 300bhp, it has a top speed of 155mph. There are also a few diesel engines to choose from. If running costs are your priority, you’ll want to take a closer look at the 116 Efficient Dynamics model. But although it’s efficient, it might feel a bit underwhelming. For more power, OSV recommends the 2.0-litre 190bhp unit which powers the 120d. Capable of getting you from rest to 62mph in 6.8 seconds, it has good throttle response, plenty of power, and also comes with the option of four-wheel drive, something no 1 Series model has had previously. The 4WD system works well here, and the car retains its agility but is naturally more stable when the conditions get tough. A 6-speed manual transmission is a standard across the range, and although it’s smooth enough, it’s springy action will surprise you at first. Once you get used to it, though, you’ll be just fine. However, there is also the option of an 8-speed automatic ‘box which is fantastic. Ride comfort is mostly okay, but the sportier trims come with a firmer suspension setup and larger alloys, which will make it harder for the car to shield you from the lumps and bumps that mar some of our poorer road surfaces. The interior is as smart and contemporary as they come, but comfort has been sacrificed for sporty handling. 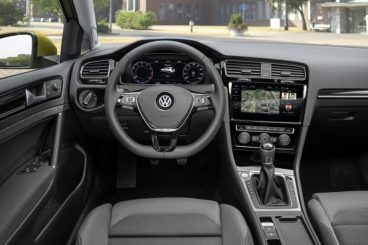 The dashboard is clean and feels robust and solid enough, but it lacks the wow factor that some of its rivals have. Moreover, it’s disappointingly lacking the advanced touchscreen tech that its rivals are starting to employ. Each 1 Series comes with a digital radio, satellite navigation, and a 6.5” colour screen, though. You control the latter via a small wheel that is mounted on the centre console. It’s usable and efficient, offering shortcut buttons which save you time as you switch between menus. If it’s not enough for you, you can upgrade to a more professional system which comes with an 8.8” screen, as well as 3D navigation and hard-drive storage space for your tunes. As standard, the entry-level models’ dashboards are covered in almost sombre, black plastics, but if you’re willing to fork out more money for a sportier trim, you’ll get treated to coloured or brushed aluminium inserts for a brighter, chirpier atmosphere. The seats are supportive and hold you nicely in place, and they’re also super adjustable. Visibility is good, although the rear window is a bit narrow – and also a bit impractical when it comes to opening them wide in tight parking spaces (they jut out). Interior space is good upfront but limited in the rear. Next, to more practical models, this one falls down a bit, especially if you opt for the three-door version. Doing so will make it hard for your rear seat passengers to even get into the car. The five-door is a bit more practical, but a rear wheel arch gets in the way when you try to fit a child seat. The boot, meanwhile, measures 360-litres. Prices for the new car start out from £21,000 and rise to around £32,500. If you want to lease the car on a contract hire, you could pay as little as £220 per month. For more information on leasing deals, you can check our page out here. In terms of running costs, this 1 Series is actually the most affordable BMW on the market right now. The most efficient of all the engines is the 116d Efficient Dynamics model, which thanks to its special low-resistance tyres can achieve fuel economy averaging 83.1mpg. It’s also free from tax. Each engine in the range comes with stop-start technology as standard, so running costs are excellent across the board. Even the range-topping M135i model is good for 35.3mpg, which is impressive for such a performance-oriented car. The 120d diesel, which is going to be among the top sellers, is good for 60mpg. The car isn’t too expensive to insure, with the entry-level models sitting in group 12. A 3-year/unlimited warranty is offered, but you can extend it to five years for a bit more cash. There is a hot hatch version available, which is obviously great fun to drive. But the whole range is packed with models that offer plenty of entertainment. For driving enthusiasts who have to make the switch to a family car out of necessity, this 1 Series gives you get the best of two worlds: driver enjoyment and practicality. The interior is smart and sophisticated. The dash is clean, and everything is easy to use. It’s ideal for family’s who need a car that gives them zero hassle. The engines might have plenty of acceleration, but BMW has blessed them with small car efficiency. Stop-start technology helps, and it’s standard across the range. Each model also gets ECO PRO, which reduces throttle response to encourage you to be more economical. One area that lets the car down is its ride quality. BMW has gone all-out to make this hatchback as sporty as possible without it basically being a hot hatch. As a result, comfort has been sacrificed. The 1 Series wasn’t very practical at all, and although this one has bigger dimensions and more usability, rear seat room is still an issue. Let’s see how it fares against its closest rivals in the comparison section of our BMW 1 Series Hatchback review. 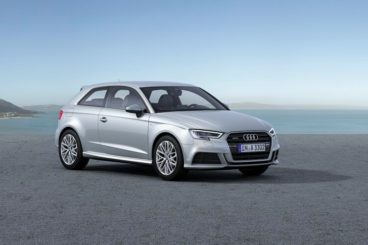 The new Audi A3 Hatchback is smartly built and comes loaded with the latest technology. The Audi A3 Hatchback isn’t bad to drive per say, but it can’t really compete with the BMW when it comes to on-the-road entertainment. It’s comfortable, predictable and safe – which are generally attributes that most families look for when buying a family car. As a result, ride quality here is better than it is in the 1 Series, with Audi paying a lot of attention on the suspension set-up this time around. 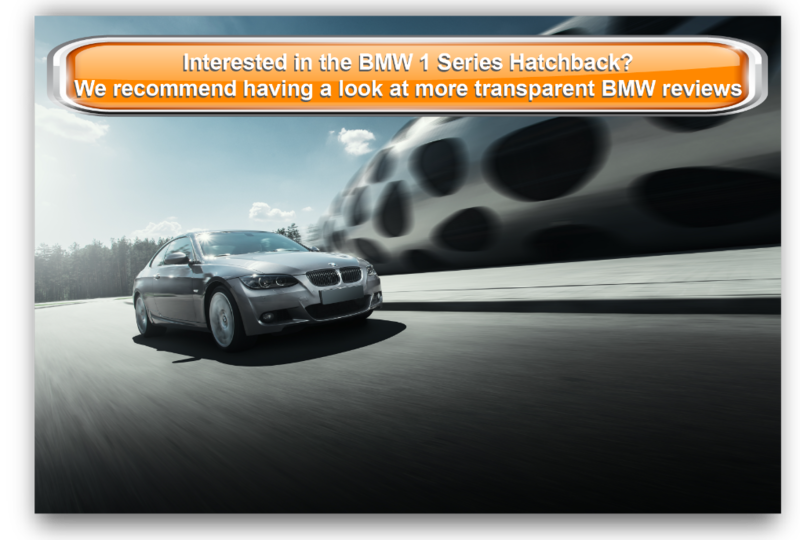 But if it’s fun you want, you will have to keep looking at the BMW, as even the sporty Audi A3 model fails to excite. OSV’s pick of the A3 Hatchback engines is a diminutive 1.0-litre TFSI petrol unit that is shared with the Golf. Capable of delivering 113bhp, it can get you from rest to 62mph in 9.7 seconds. The 1.4-litre TFSI petrol unit takes things up a notch and covers the same distance in 8.1 seconds while delivering up to 148bhp. There are a handful of diesel engines on offer too, including a sprightly 2.0-litre 148bhp that is cheap to run, averaging returns of 70.6mpg. In fact, fuel economy is good across the range, and even the petrol engines are frugal. For example, our preferred 1.0-litre TFSI unit is good for 63mpg. 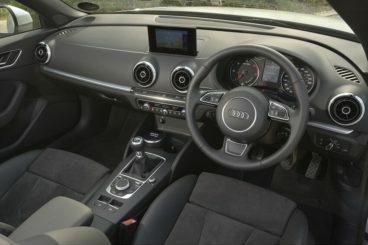 In terms of its interior, the A3’s cabin is one of the best around. The Audi team have put a lot of heart, soul and imagination into the interior, which is symbolised by the air vents which are so detailed that they are pretty much a work of art. The car doesn’t major on practicality, though. Although it shares a number of parts with the VW Golf and the SEAT Leon, it just isn’t as usable as those two. Four people can sit in reasonable comfort, but the space between the back and front wheels is not as expansive as you’d prefer. However, the car can negotiate tight streets well, visibility is good, and the boot measures 365-litres. 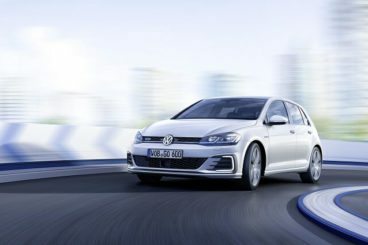 The Volkswagen Golf Hatchback is a motoring institution, and anyone on the hunt for a new small family car should always put it on their shortlist. The VW Golf Hatchback isn’t one of those cars you have to consider just because “it’s a VW Golf and a bit of a legend.” It should be considered because it’s good – and has been good for a long, long time. In its latest guise, it benefits from turbocharged petrol engines which mean you get to spend less money at the pumps. There is also a clutch of diesel engines to choose from, and all models are good fun to drive. The only one we’d suggest avoiding is the basic 1.2-litre TSI petrol that delivers 84bhp. It’s got a punch to it but lacks the killer touch when it really matters and will start to flag way before the twelfth round. In other words, it isn’t suitable for frequent motorway trips. Instead, we like the look of the 1.0-litre TSI BlueMotion engine which is smooth and covers the 0-62mph sprint in 9.7 seconds. In terms of the diesel units, a 2.0-litre 148bhp offers a surprising amount of space and agility. All engines are cheap to run, too, but the headline-grabber is a 1.6-litre TDI diesel engine which delivers 108bhp and which is good for 83.1mpg. The Golf is also very, very comfortable and refined indoors. Along with an upmarket interior, it looks, feels and sounds the business. It also has more advanced technology than the BMW and comes with a classy wraparound dash that is composed of the kind of high quality you expect to find in the class above. The interior is also spacious and can offer a good amount of leg and headroom to those upfront and in the rear, and there is even room for a fifth adult. The boot, meanwhile, measures 380-litres. Few premium cars justify their price tag as well as the 1 Series. For just over £20,000, this stylish hatchback offers entertainment for all the family. It’s fun to drive, inexpensive to run, and looks stunning inside. 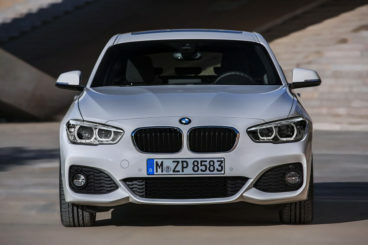 Fresh, contemporary and powerful, the new BMW 1 Series Hatchback combines family-friendly appeal with a bit of bite.